In order to drink beer, one usually needs some type of drinking vessel. 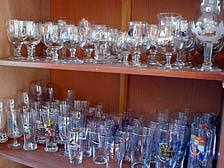 Vermin Brewing is proud to share its beer glass collection, which currently numbers close to 100 pieces. Most of the glasses were donated by a variety of sources and friends. This website displays only a few of them.